The Burning Mountain Festival is a popular annual electronic music and art festival which is a four-day experience of self-commitment and self-expression. The Festival is an open canvas giving you the chance to leave your mark. Being a social survival camp in this digital age, with the Festival, you would be able to connect and interact with a great number of people face-to-face. The music here at The Burning Mountain Festival is exceptional and you would enjoy dancing throughout day and night. Have fun drinking and dancing to the lively beats and then enjoying a great night with friends by the campfire and under the starlit sky. You need to be into it before attending the festival, I do not recommend it for touristing. Personally, love it. Relatively small area fully packed with good music, mood and people for 5 days nonstop, despite weather. Respect! A smallish festival with beautiful scenery and the best proggresive dj's in Europe. Music doesn't stop once started until the festival finishes. Which is fine by me 👌 Quite expensive as Switzerland already is so make sure you have enough money! Lockers are available too. 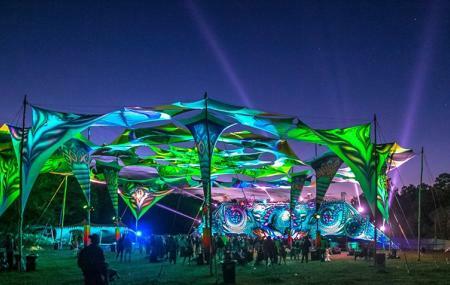 Amazing psychedelic trance music and beautiful location!